In addition, you can put the computer to sleep or turn off the display, lock Windows and more for power savings and privacy protection. 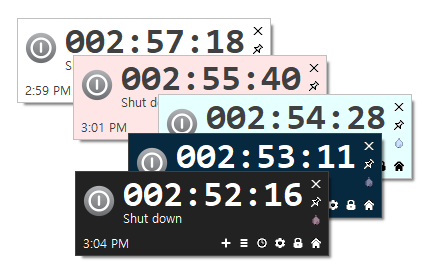 You can shut down or restart, suspend, hibernate Windows, turn off/on the display, start a screen saver, lock Windows, get an alarm, run/terminate a program at a specified time with easy options. You can schedule a repeative task and you can schedule multiple tasks at the same time. You can see the Today's Usage Time, Run Count and so on. You can change Alarm Sound. You can prohibit schedule changes and program termination with Password Lock. You can run a function of AutoOff immediately with a System Tray menu. * When processes are forced to terminate, you may lose data.